58014 • Tamiya Martini Mk22 Renault • (Radio Controlled Model Archive) • RCScrapyard. 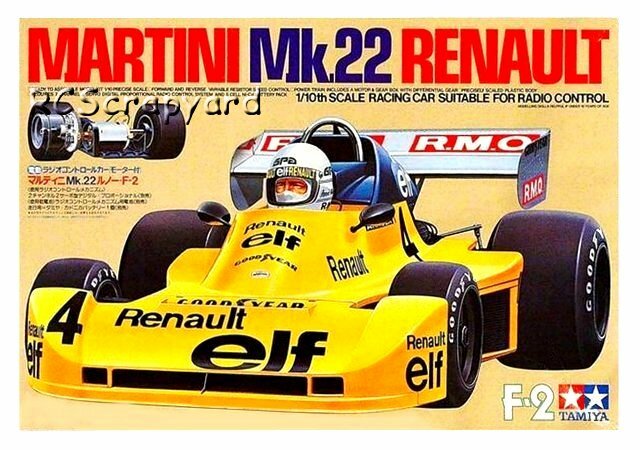 Released by Tamiya on June 28, 1979, this RC model of the Martini Mk22 Renault was based on the alloy plate F2 chassis. René Arnoux and Didier Pironi raced the real Martini Mk22 Renault in 1979 in F2 racing, both with limited success only. 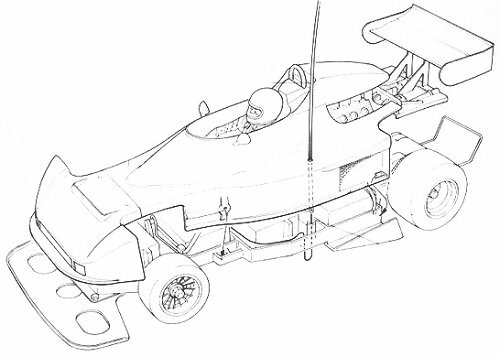 The Tamiya model was released in June of the same year and faithfully reproduced in great detail the original F2 car's body shell in ABS hard plastic, complete with all the cars livery. Enthusiasts found the kit easy to assemble and loved the realistic body shell. The only real disappointment was the under powered RS-380 Motor. Unfortunately this was never very popular globally and although rare to locate, are not as collectable as other car models in the "Tamiya First 100". This is reflected in the low purchase price of the model today.